The Lucerne Valley Unified School District's enrollment has climbed to its highest number in several years. Kindergarten teacher Jeraldin Villela and bus mechanic Mark Nustad were named the certificated and classified employees of the month, respectively, at Thursday’s monthly meeting of the Lucerne Valley Unified School District’s governing board. District Superintendent Peter Livingston presented the award plaques and each award recipient was thanked by school board members. Working with both the kindergartners and younger transitional kindergarten students, Villela has been credited with being a calming influence on new students. The teacher’s gentle disposition is making a difference. Nustad’s supervisor, Jessica Koahou, said that his dedication and professionalism are of the highest order. 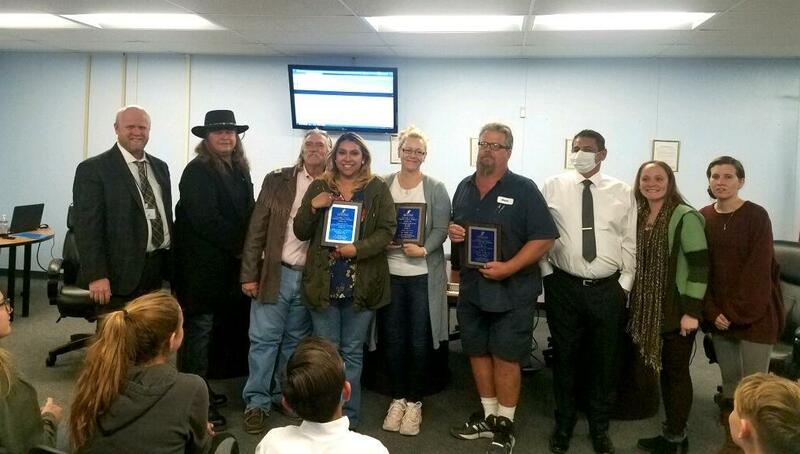 In February, the school district selected teacher John Wortham and warehouse/delivery driver Jody Klaus as its employees of the month. However, neither was available to receive their awards last month. As a result, Klaus received her award on Thursday. (A school event again prevented Wortham from making the meeting). Klaus has taken pride in her work throughout her eight years at the school district, Livingston said. Also during Thursday’s meeting, Umstead and Middle High School Assistant Principal Kelly Boeing gave a glowing report about the district’s ongoing implementation of Multi-Tiered Systems of Support. MTSS, they explained while holding a handmade poster, is an instructional framework that helps all students through the use of different levels. Tier 1 features Researched Based Core Instruction, Tier 2 is Targeted Intervention, and the third, highest tier is Intensive Intervention. Tier 1, they said, is for all students while the two upper tiers provide supplementary teaching and intervention for students who are struggling. On the team’s poster, Umstead said the tiers were represented by the two branches and trunk of a Joshua tree. Several presentations were made during the meeting, including a middle school report by Kylee Lambert. Following the school report, Kylee introduced the state tournament-bound [DIDAR]2 Destination Imagination team which the 7th-grader is a member. This year’s overall Lucerne Valley Elementary School science project winner Zoey Davis presented an update on school activities, and student Abigail Johnson spoke about AVID and high school activities. Lucerne Valley FFA Chapter advisor Danielle Hickman, Chapter President Hollie Lopez and Reporter Tatum Fox presented an informative PowerPoint presentation of the many FFA activities. A Sky Mountain Charter School representative also gave an update on the school, one of several charters under the oversight of the LVUSD. Enrollment is going up at the charter school, she said, with current enrollment at 1,765 students. Lucerne Valley’s enrollment has climbed to its highest point in several years, according to Livingston’ report during the meeting’s Information/Discussion segment. The largest numbers of students enrolled in the district earlier this month was 774 students, which is more than 100 students higher than enrollment several years ago. “That upward trend continues,” he said. Also during the meeting, the board unanimously approved the district’s Second Interim Report presented by Chief Business Official Douglas Beaton. Beaton described the district’s finances as “satisfactory financial condition.” The board also accepted the Lucerne Valley Teachers’ Association proposal for negotiations and adopted the district’s initial bargaining proposal.